Alhamdulillaah, all praise is to Allaah, the Al Mighty, the Most Glorious, Most High, Most Powerful who has allowed me to perform my Hajj and gave me a safe return, alhamdulillaah. Like all other pilgrims, I believed that what I had experienced within those 25 days were beyond words and description. There are too many incidences that happened to me and other pilgrims that had made me reflect deep and hard. SubhanAllaah, what i can say is that, truly, Allaah is indeed Most Loving, He Listens and He, our Lord, truly is the Responder to all requests and prayers...subhanAllaah. Words cannot describe the feelings I had day-in, day-out being His guests, in His Home, subhanAllaah. And my brothers and sisters, this is one duty that would insha Allaah bring us closer to Him, in a manner that is very special. I knew now, deep in my heart that He wants us to perform the Hajj for reasons that would benefits us. Period. Not for Him, but for us. “Hasten to do Hajj – meaning the obligatory Hajj – for none of you knows what will happen to him.” Narrated by Imam Ahmad (may Allaah have mercy on him), 1/314; classed as hasan by al-Albaani in Irwa’ al-Ghaleel, 990. Therefore, let us all start saving bit by bit, making the intention and have all the trust in Allaah to assist us to make the beautiful journey of a lifetime a reality as quickly as possible, ameen. thanks for sharing the picts, dear. My children have got thousands of questions for me to answer!!LOL! We've been doing a lot of work on Hajj recently (my way of preparing them + myself for my coming journey, InsyaAllah). Brother Ian, Ameen to your prayers. Alhamdulillaah, I got more than I could handle opportunities to snap these pictures. Actually, I had to buy a new memory card just so that I could continue snapping without reservation, alhamdulillaah. 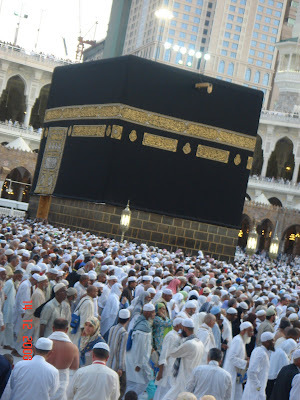 Insha Allaah, I pray that you would be making that trip soon, ameen. I am glad to know that the pictures have inspired you in some ways. So, next step- increase savings for Hajj, insha Allaah! MashAllah ,You were able to perform the great pilgrimage.Thanks for sharing it with us. glad to hear that you are invited by Allah last year! nice blog and nice book too..
Assalamualaikum to my dear sis Zabrina and all. MasyaAllah. Subhanallah. Alhamdulillah. Welcome back dear! And may Allah bestows you with haj mabrur.Ameen. salam...u got a nice blog..